If you follow me on instagram (kitchen3n), you’ll notice I went on a little trip recently! I had the opportunity to help organize a company retreat at the magnificent Qasr Al Sarab in UAE (about 2 hours south of Abu Dhabi). It was my first time abroad since having my kids so you can be sure leading up to the trip I juggled feelings of anxiety and excitement…but mostly anxiety. As difficult as it was leaving the kiddos behind for a whole week, it was so refreshing and rewarding to immerse myself in work, in a new place, with faces that I don’t see often. The food at the resort was fabulous and plentiful. UAE is truly a mix of ethnic groups and it shows in the dining options. Traditional emirati dishes are punctuated by South Asian, Filipino and pan-Arab foods. Some of the most memorable items I had were fresh labne (strained yogurt), congee (chinese rice porridge with dried shrimp and soy sauce), stewed tomatoes, bbq beef short ribs, and mustard (yes – the condiment, a whole grain, fruity, spicy concoction) atop veal chops – ugh, it was heavenly. One thing they did not have, was my fried chicken. That, you have to come to Kitchen3N for. My fried chicken is special in that I brine it in a buttermilk, salt and spice mixture that gives it incomparable tenderness and flavor (a nod to smitten kitchen’s buttermilk roast chicken). Then, to make it even more special, the coating it gets before hitting the hot oil is a combination of flour, bread crumbs and even more seasoning. Finally, I finish it in the oven on a wire rack atop a baking sheet because I can never seem to get it cooked throughout without burning the outside when I stick to just the stove top method. Thanks for the idea, Ina. I don’t even know why I’m disclosing my secrets. Yes, I want you to have outrageously good fried chicken. No, I’m not opening a restaurant any time soon. I suppose these are good reasons for sharing. I used to be horrid at fried chicken. I would impatiently put the chicken in before the oil was hot enough. I didn’t bother with the extra step of finishing in the oven so half the pieces would be pink inside. So now, when I make fried chicken, though it is a production with the brining, coating, frying, and baking, it is so worth the end result. I mentioned in earlier posts the immeasurable importance of a candy thermometer (pun!). It is essential in regulating the heat of the oil, as it varies so much from when all the pieces are just placed in, to when they are cooked, to when the pan is empty again in between batches. I kept my oil between 325 and 350 – this is optimal for ensuring the outside doesn’t brown too much. Though I wish I could share a no-frills fried chicken recipe with you that didn’t involve more than 2 steps or kitchen gadgets, these were the things that I’ve found to set mediocre fried chicken apart from Ridiculously Good Fried Chicken. These are like Throwdown-with-Bobby-Flay Good Fried Chicken. Several hours or the night before cooking, combine buttermilk, garlic, paprika, salt and both peppers in a bowl or gallon ziploc bag. Combine well and add the chicken legs and thighs. Let marinate for at least two hours, but better yet at 6-8 hours. Pour oil into a cast iron skillet or casserole pan so the oil is 1 to 1 1/2 inches deep. Turn on the flame and using a candy thermometer inserted into the oil and attached to one side of the pan, bring the heat up to 325 degrees F. This takes about 10 minutes or so over high heat. Preheat oven to 350 degrees F. Place a wire rack over a baking sheet and set aside. The wire rack is essential here because if you place the chicken directly on the baking sheet, the underside will get soggy. In a shallow dish combine flour, bread crumbs and remaining seasonings. Carefully take out chicken pieces, shaking off the excess and place into flour/bread crumb mixture. Coat evenly, 3 to 4 pieces depending on the size of your pan, and carefully lower into the oil. Regulate the heat so it doesn’t go above 350 or below 325. After 5-7 minutes, flip and cook until the other side is golden brown (another 5 minutes or so). Place on the wire rack and continue with the next batch. When all the pieces are fried and placed on the wire rack over the baking sheet, bake in preheated oven for 15 minutes. After 15 minutes check one of the thigh pieces for doneness by cutting right through the middle and ensuring that the meat closest to the bone is not pink and the juices run clear. If not done, stick back in the oven for 5 more minutes. I have an exciting announcement to make! No, I’m not expecting baby number 3 as my mother would so desperately hope for. I am partnering with awesome, organic, halal and quality meat provider Honest Chops! Gone are the days when us strictly zabihah halal eating folks were limited to the options available at our local butchers (God bless them, but good luck if you’re looking for a steak or any other sizable cut of meat). With Honest Chops, not only can you get a great selection of cuts, but you can rest assured the animals are local, were raised humanely without steroids or antibiotics, and are zabihah halal. Some, including the lamb and beef, are even grass fed! YUM! For the next few weeks I’ll be posting a new recipe each week highlighting some of the great cuts of meat they have to offer. I love you guys. I love them. I hope you guys love them as much as I do! For my first post, I’m offering a turkey alternative for your Thanksgiving spread. I promise, non-turkey poultry is not sacrilege. Plenty of people (ahem, husband) aren’t fond of turkey. Some people do cornish hens, maybe even a large roasted fish (Everybody Loves Raymond, anyone?). A roast chicken is perfect for a more intimate gathering. The way I do it here, in a cast iron skillet, is wonderfully homey, rustic and easy! No need to get down the giant roasting pan (or purchase one just for this once a year dinner). You just need to ensure your skillet is well seasoned (read: greased). If you don’t have a cast iron skillet, any heavy, large, oven proof pan or casserole will do the trick. I used an herbed butter to flavor the bird and the surrounding potatoes. It’s got some of the traditional fall flavorings: sage, thyme, orange and lemon zest. But don’t be alarmed by the amount of seasoning – it’s enough for the bird, potatoes, and probably one more roast chicken. You could substitute other root vegetables in lieu or in addition to the potatoes – you just want to ensure it’s cut big enough to withstand the long cooking time. This was a pretty small bird, weighing in at 2.5 lbs. It only took 1 hour at 450 degrees F for the internal temperature at the thigh to reach 165 degrees F. I believe it’s an additional 15 minutes per pound – but your best bet is either a meat thermometer or slicing into the thigh to see if the juices that run are bloody or clear. Just in case you needed a visual for where to place the meat thermometer. Now there are all these different techniques for ensuring juicy breast meat. Flipping the bird (not that kind!) halfway through the cooking process. Spatchcocking. Dorie Greenspan suggests Joel Rubechon’s technique of cooking the bird on its side, flipping to the other side, then after it’s done, turning it upside down and doing a rain dance (for moisture, of course). Ok, I made up the dance part just to show what lengths some will go to. The fact of the matter is – white meat is white meat. It’s inherently more fibrous than dark meat. But with a bird this size, I doubt you will run into issues with it drying out. I say this after roasting this in one position for the whole time, without any basting. Though, I will say, with the herbed butter spread between the skin and the meat, that ensures a sort of self-basting. If you don’t have sage, I’d imagine rosemary would work well. Or even tarragon. Something earthy! The last thing you need is some kitchen twine to tie the chicken’s limbs to the body (you don’t want the limbs flapping about, otherwise they’d overcook). With that said – happy eating and start to a holiday season! Preheat oven to 450 degrees Fahrenheit. Rinse the chicken, removing any remaining feather shafts that might remain. Remove giblets and neck, setting aside for stock or curry. Set on a large plate or cutting board and pat dry with a paper towel. Add butter, orange zest, lemon zest, minced garlic or garlic paste, sage, thyme, salt and pepper into a bowl and mix well. Place chicken, breast side up, and rear cavity facing you. Insert fingers between the skin and breast meat to separate (careful not to tear the skin). Add a spoonful of butter and spread throughout the breast, under the skin. Repeat for other breast. Smear more butter over the skin, over breasts, legs, thighs and wings (though don’t butter the back side, the side that will be in direct contact with the skillet). Stuff the cavity with the remaining garlic head (sliced through the middle like this) and however much of the remaining citrus you can fit (giving the fruit a little squeeze before inserting). Cut two pieces of kitchen twine: one to wrap the legs together, the other to tie the wings to the body (see picture). Wash hands. Preheat greased skillet over medium high heat for a few minutes. Add chicken, then potatoes around the chicken. Drizzle olive oil or vegetable oil over the chicken and potatoes to ensure the butter doesn’t burn. Use a pastry brush if necessary. Stick into preheated oven and cook for 1 to 1 1/2 hours, depending on the size of your chicken. A meat thermometer inserted into the thigh (see picture) is the best indicator of doneness (reading should be 165 degrees F). Otherwise, cut a slit into the thigh meat to see if the juice is clear or bloody. If bloody, stick back into the oven for 10 to 15 min more. As a final note – don’t toss those pan drippings! We’re not gravy crazy around here so I made a quick pasta and peas dish. Simply toss the carcass and remove the vegetables from the pan. Warm it over medium high heat. Add half a pound a cup of frozen peas. Cook for 2-3 minutes. Add cooked long pasta (half a pound of spaghetti or fettucine). Cook until warmed through. Add a sprinkling of grated parmesan. 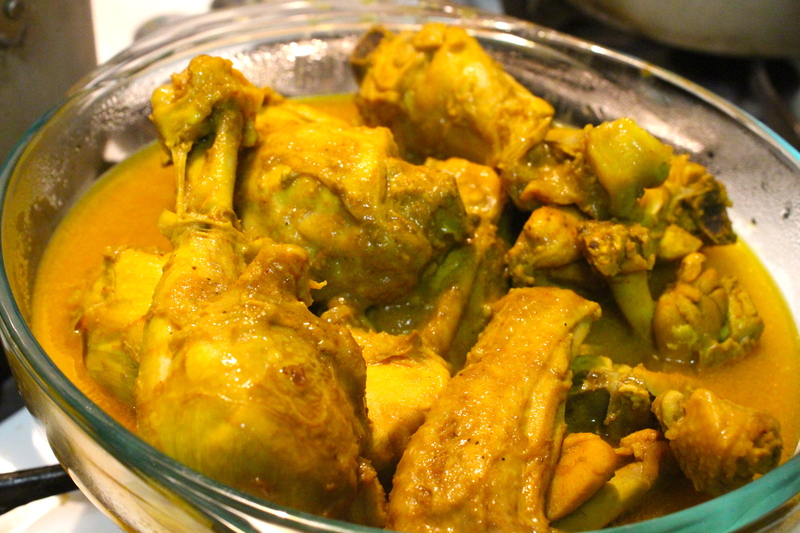 There is no coconut milk in your chicken curry if you are Bengali. There is no curry paste or any other amalgamation of ingredients someone else deems necessary for your comfort-in-a-bowl chicken curry. There is only your mother, your childhood, the pieces of white meat that no one ever wanted, the potatoes that you cared for only on some days, the jhol (broth) that was literally chicken soup for your soul (but only the first day, after that it just got too cardamom-y), and the leftover bones that you LOVED to chew on as you churned out every last drop of flavor but NEVER admitted to doing outside of bengali circles. Of course this is my childhood we are recollecting and thus my mother’s recipe. There is very little room for improvement…though one could probably use chicken stock (even better, homemade chicken stock) in lieu of the water. Let’s leave that for another day, another post. For now, amidst the pristine image laid out for you of a little girl enjoying every minute of being elbow deep in her favorite food, there are some hidden perils that threaten. Hear me out: have you ever, during the course of your meal ever landed on a “flavor bomb” ? One of those whole peppercorns, cloves or worse, entire cardamom pod?? It’s disgusting! It’s painful! It’s downright heinous. Takes half the joy out of the meal. I just thought of taking the extra step of pouring the jhol through a sieve and voila! Flavor. Bomb. Out. I hope this recipe takes you back to your childhood! Heat the oil over medium high heat in a saucepan or any medium sized pot (about 4 qts) with high sides. Add the onion and let soften for 4-5 min. While onion cooks, prep your garlic and ginger, if necessary, and combine the ground spices in a bowl. Add spices to the onions, mixing well. Add the chicken pieces, turning to coat with as much of the masala mixture as possible. Let the chicken and spices cook for 4-5 minutes, taking care not to burn the spices (reduce the heat if necessary). Add garlic, ginger, water, salt, bay leaf, cinnamon, cloves, cardamom and peppercorns. Stir, then increase the heat to bring to a boil. Reduce to a simmer and cover. Let simmer for 20-25 minutes, removing the lid during the last 10 minutes if there is too much liquid. Check for seasoning. Add more salt or spice as needed. Optional: Transfer chicken pieces to a serving bowl. Pour the broth through a sieve to catch all the whole spices and push through all the last bits of curry through the sieve using a spoon. Increase cooking time by 2-3 minutes, testing the thickest part of the thigh to check for doneness. Try sautéing some tomatoes into a large fry pan or wok and add the leftover chicken curry. When thoroughly heated through, remove from heat and add some chopped fresh cilantro.